This casual neighbourhood eatery offers affordable Japanese dishes made with Vietnamese ingredients. Duhwee Pham reports. While Japanese cuisine has been available in Viet Nam since the 1990s, recently there has been a new wave of authentic options. As Japan and Viet Nam's relationship took big strategic steps that brought overseas Vietnamese back from Japan and Japanese to Ha Noi, Japanese quarters developed in Kim Ma and Trieu Viet Vuong areas. 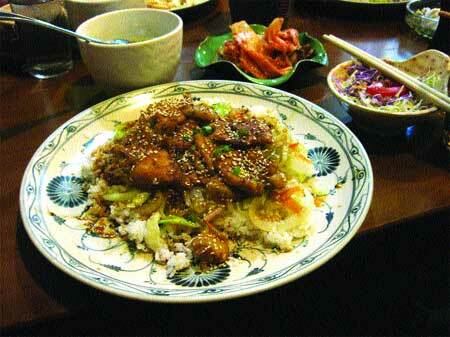 The resulting demand forJapanese food led to the opening of many authentic restaurants. However, many of these new restaurants are upscale. The capital still lacks affordable Japanese places that are the equivalent of one's trusty pho xao stand. Recently opened on the busy street of Thai Ha, Hana Quan ("Flower Restaurant") hits that bull's-eye. Their goal is recreating the taste of Japanese cuisine from common ingredients found in Viet Nam. Phuong, the owner, has a farm on the outskirts of Ha Noi that supplies the restaurants with clean and nutritious ingredients every day. Under the advice of seasoned Japanese chef Narisada Katsuhiko, who pops in every now and then, chef Jackson Quynh never fails to deliver quick and appetising dishes. A regular since their inception, I have tried out every single dish they offer and gotten a satisfying meal every time. For merely VND50,000 you can have a bento or Japanese lunch box. 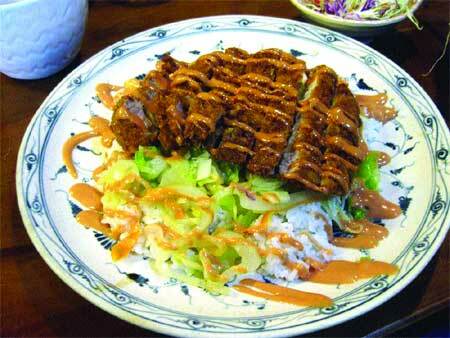 Nicely cooked rice is accompanied by cabbage salad with Japanese sesame dressing and minced pork and vegetable soup. While Japanese restaurants typically offer miso soup, Hana came up with its own - midway between a Vietnamese canh and the more traditional Japanese broth-to warm up your appetite. Depending on the day, you can choose from a few main courses. Tonkatsu or fried pork is crunchy on the outside yet juicy on the inside, without a trace of grease. Served with stir-fried cabbage and a choice of Japanese Tonkatsu sauce (similar to Worcestershire sauce) or a Vietnamese sauce made by mixing ketchup and mayonnaise into a flaming pink concoction (it tastes far better than it looks!) this is one of the best dishes on the menu. Head chef Quynh explains that the tastes of Vietnamese people served as his inspiration for the ketchup sauce: "They like something sweet with a bit of fat." Other dishes that go well with Tonkatsu sauce are Korokke and Yakitori. Korokke is pork coated in mashed potato, creating thick patties that are then fried. Yakitori here is not the grilled chicken you would find in a yakitori joint in downtown Tokyo, but good old down-to-earth fried chicken. If you don't mind a bit of fat, try Yakibuta, pork belly roasted with sesame that offers rich flavours in every thin slice. 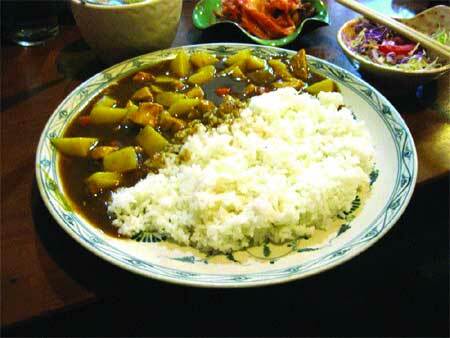 Those who prefer a lighter meal can opt for Karetori, Japanese curry. Chicken, potato and carrot are stewed in a curry roux, resulting in a creamy, tender dish. Unlike Indian curries, Japanese curry is mild and a bit sweet. The other two options, Subuta and Chahan, still need to be refined. Subuta is supposed to be sweet and sour pork, yet you can hardly tell where the sweet and sour are. The plain stir-fry preparation doesn't give it an edge in the texture department either. Chahan, while being a good substitute for the oilier com rang, doesn't deserve a place on the table next to the other excellent options. If your appetite and budget extend further, you can also have Yakiniku, meat you grill at your table, which costs VND150.000 per plate and features pork belly, beef and a generous amount of vegetables such as eggplant, onion, bell pepper and pineapple. The quality of the meat is consistent, not too chewy and the Japanese grill keeps the oil away from your chopsticks. If you feel a bit fancy, you can choose Gyudon or Wagyu beef -- a bit pricier but worth the dong! Servers here don't have the standardised clean-cut Japanese look, but make up for it with their cordial and warm attitude. They rarely hesitate to offer you another serving of side salad, another bowl of soup, extra sauce for fried dishes or even kimchi on the house. The decor of simple bamboo tables and chairs have the unmistakable feel of a Vietnamese restaurant. The light however is a bit lacking; it can get hot when there are multiple grilling tables.